A new Minister for Cities, the innovation statement and conferences focusing on cities, health and urban issues: urban planning and data analytics are gaining traction as hot topics. Consequently, AURIN has been in the news in two recent media stories. With the rise of big data, Australia’s future cities could be safer, more affordable and better for your health. 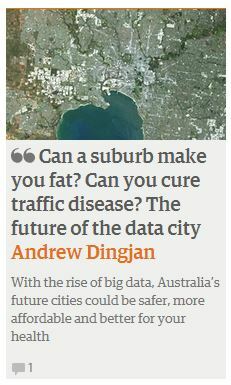 AURIN director Andrew Dingjan has written an opinion piece for The Guardian Australia, advocating for good urbanplanning supported by sound data-driven evidence. The Australian Financial Review also has its sights on ‘big data’ and how data-driven intelligence can give businesses a competitive edge. The story ‘Westpac, Microsoft join ‘big data’ engine venture’ includes the AURIN and PwC agreement as an example of this approach applied to smarter decision making for infrastructure investment. This entry was posted in Business, Health, Latest News, Transport, Urban Development, Walkability. Bookmark the permalink.